Depot of Disappearance is a text-based installation that addresses issues of memory, space and cultural policy. It takes as its focus an independent arts organization, Depot, which was located in the MuseumsQuartier in Vienna during 1994-2001. Fragments of personal memory and knowledge (or ignorance), be they contradictory or consistent, of Depot during this period from diverse individuals collectively suggest a metaphor for the independent cultural development in the times of socio-political changes. To recall the immediate past is neither a relief from fear of disappearance or a pursuit for nostalgia. Instead, it is to contemplate disappearance in its own right. In fact, Depot continues to exist behind the MuseumsQuartier today. 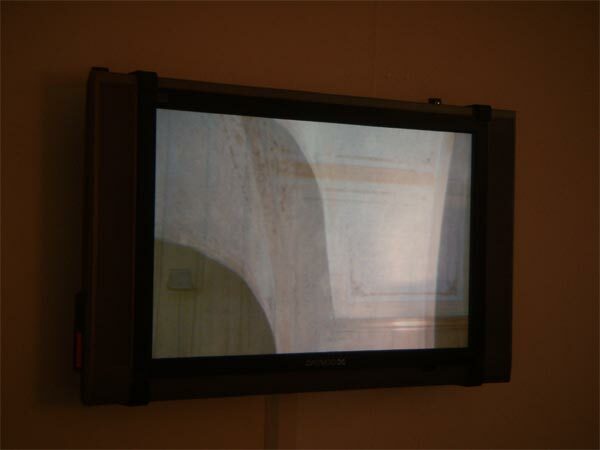 The video was edited from still images (empty corners) of the old premises of Depot which are generated into slow motion. The soundtrack is the monologue by the artist, compiled from the replies from more than 100 interested parties about their knowledge and memories of the old Depot (or their lack of it). It is about 40 min long and played in loops. 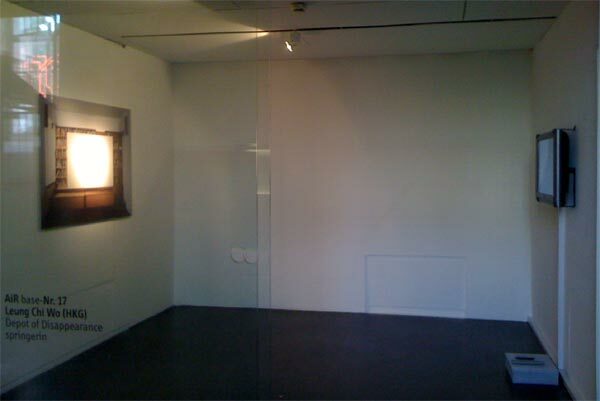 Opposite to the video is a straight-shot photograph of the present Depot’s main room with a blank screen, measured the same size as the LCD monitor. “Well, I’ve heard about the space, but never went there. 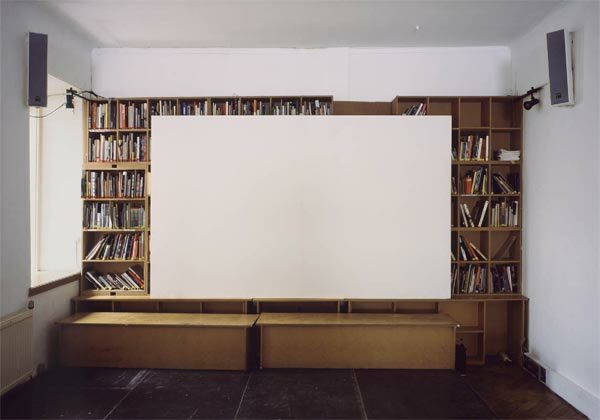 Vito Acconci, Tejpal Ajji, Dorothee Albrecht, Hildegund Amanshauser, Pamela Auchincloss, Kathrin Becker, Konrad Becker, Lorenzo Benedetti, Tobias Berger, Ursula Biemann, Bik van der Pol, Silvana Borutti, Andrea Braidt, AA Bronson, Adam Budak, Susanne Clausen, Anne Deschka, Katy Deepwell, Michael Diers, Stephen Duncombe, Harun Farocki, Maurizio Ferraris, Judith Fischer, Alvaro Rodriguez Fominaya, Ole Frahm, Andrea Fraser, Anita Fricek, Martin Fritz, Rainer Fuchs, Sonja Gangl, Jeremy Gilbert, Brian Goldfarb, Clare Goodwin, Eva Grubinger, Claudia Haas, Sara Haq, Hitomi Hasegawa, Vinzenz Hediger, Nicola Hirner, Joachim Hirsch, Sabina Hörtner, Nina Höchtl, Oscar Ho, Sabine Hornig, Ian Hunter, Ursula Hübner, Hu Fang, Hitomi Iwasaki, Mary Jane Jacob, Martin Jay, Sabine Jelinek, Brett Jones, Sunjung Kim, Arthur Kleinjan, Jay Koh, Karl-Heinz Klopf, Jeannette Koller, Jan Kopp, Frauke Kreutler, Richard Kriesche, Henry Krips, Charles Labelle, Gerda Lampalzer, Dinh Q. Lê, Lee Weng Choy, George Legrady, Christopher Lew, Christina Li, Ernst Logar, Sandra Lourenço, Manu Luksch, Yung Ma, Sophie McIntyre, Alejandro Meitin, Matthias Michalka, Jan Nederveen Pieterse, Ruth Noack, Elaine Ng, Morgan O’Hara, Tozer Pak, Klaus Pamminger, Madeleine Park, Dominik Portune, Doron Rabinovici, Martina Reuter, Simon Reynolds, Stella Rollig, Marlene Ropac, Jonathan Rosenbaum, Victoria Rowley, Catherine Russell, Jayce Salloum, Julian Samuel, Christoph Schäfer, Klaus Schafler, Heinrich Schmidt, Stih & Schnock, Georg Schöllhammer, Gregory Sholette, Dirk Snauwaert, Carol Stabile, Eva Maria Stadler, Eugene Tan, Philip Tinari, Thomas Tode, Momoyo Torimitsu, Shirley Tse, Rieko Tsubaki, Hilary Tsui, Herwig Turk, Heidemarie Uhl, Holger Kube Ventura, Alejandro Vidal, Erik Vogt, Heimo Wallner, Martin Wassermair, Jason Wee, Nina Wotapka, Jun Yang, Pauline Yao, June Yap, Wolfgang Zinggl, and more….